Nasir Hussain – The unsung hero behind Yaadon Ki Baarat, Teesri Manzil, Qayamat Se Qayamat Tak, etc. Born in 1926 to a conservative family, Nasir Hussain had a keen interest in movies and theatrical works. However, his father who was a history teacher was apprehensive of Nasir Hussain’s passion but that did not deter him from doing what he loved the most. When he moved to Lucknow to pursue his BA, he actively began writing short plays for radio and at times even played minor roles.Film producer Sashadhar Mukherjee impressed by Nasir Hussain’s writing credentials hired him for his Filmistan studios in 1948 and there was no looking back for Nasir Hussain. The same producer inspired Nasir Hussain to start directing and his first movie was Tumsa Nahin Dekha with Shammi Kapoor in 1957. An important anecdote from his days at Filmistan is that when Hussain decided to direct his debut film Tumsa Nahin Dekha (1957), he wanted Dev Anand to play the leading role. But since Dev Sahab turned down the role, Sashadhar Mukherjee wanted him to take Shammi Kapoor. Hussain was skeptical about this suggestion. 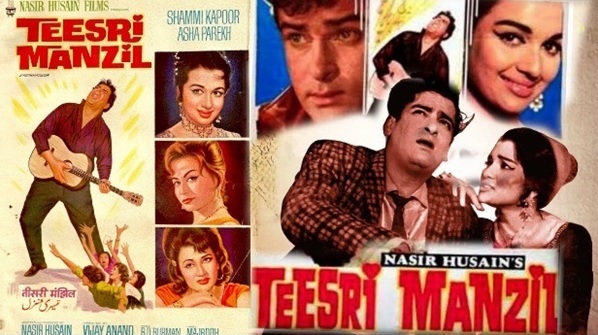 Shammi Kapoor himself was considering quitting films when Tumsa Nahin Dekha was offered to him. But as luck turned out, Tumsa Nahin Dekha clicked in a big way at the box office and there was no looking back for both Hussain and Shammi Kapoor. With such a strong element of romance in his films it is but natural that his films were known for their superb music. Each and every composer did some of their best work for him be it OP Nayyar (Tumsa Nahin Dekha, Phir Wohi Dil Laya Hoon), Shankar-Jaikishen (Jab Pyar Kisise Hota Hai), Usha Khanna (Dil Deke Dekho) and of course RD Burman who did all of Hussain’s films following Teesri Manzil (1966). In fact The Nasir Hussain-RD Burman-Majrooh Sultanpuri team created musical history together through Teesri Manzil, Baharonke Sapne, Pyar Ka Mausam, Caravan, Yaadon Ki Baarat, Hum Kisise Kum Naheen and Zamane Ko Dikhana Hai. For all the music lovers, you may recognise Nasir Hussain better, for he is the one whose songs are most remembered. Still guessing? O Haseena Zulfon Wali, O Mere Sona Re, Churaliya Hai Tumne Jo Dilko if not the original, the remixes will ring a bell. Adding to this list are, ‘Aye Mere Husafar’ or ‘Papa Kehte Hain’! His son Mansoor Khan took over the reins and Hussain continued to write for Mansoor’s films like Qayamat Se QayamatTak (1988) and Jo Jeeta Wohi Sikander (1992). Among his firsts is also the cult movie Jo Jeeta Wohi Sikandar which highlighted the issues of competition, failure in love and a strong desire to fit in, that every teenager faces even today. To entertain viewers with unheard stories of Nasir Hussain and enhance their movie-viewing experience, Zee Classic has also curated special features revolving around the life of the legendary filmmaker. It includes views of stalwarts of Indian cinema like Salim Khan, Javed Akhtar, Juhi Chawla, Ayesha Jhulka, Prem Chopra, Dalip Tahil, and Lalit Pandit amongst others. These special features along with additional exclusive interviews will be showcased during the telecast of movies on Zee Classic. Watch ‘Nasir Hussain Film Festival’ starting 7th January, every Sunday at 12 noon only on Zee Classic.